The Maricopa High School Marching Rams took their 2016 field show “Postcards” up to beautiful Flagstaff for Northern Arizona University (NAU) Band Day on Saturday. 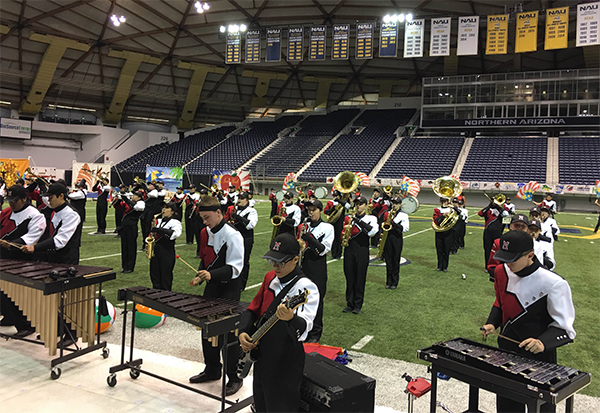 The Marching Rams performed in the Walkup Skydome at NAU, were adjudicated by a great panel of judges and got to get a glimpse of a college band with a great performance of the NAU Lumberjack Marching Band. The Marching Rams gave their best performance to date, improving on last week’s state qualifying score and earning the second-highest rating of Excellent. The band earned praise for improvement over last week in several areas, including timing and articulation clarity, but most noticeable was a big improvement in color guard performance. Nov. 5 – ABODA State Marching Band Festival at Dobson High School (performance schedules posted at ABODA.org). Nov. 19 – AzMBA Championships at Chandler Perry High School. Times are TBD for this event but should be released shortly. The Marching Rams will also reprise their field show music at the “Pass in Review” Music Concert on Dec. 6 in the Performing Arts Center at MHS.